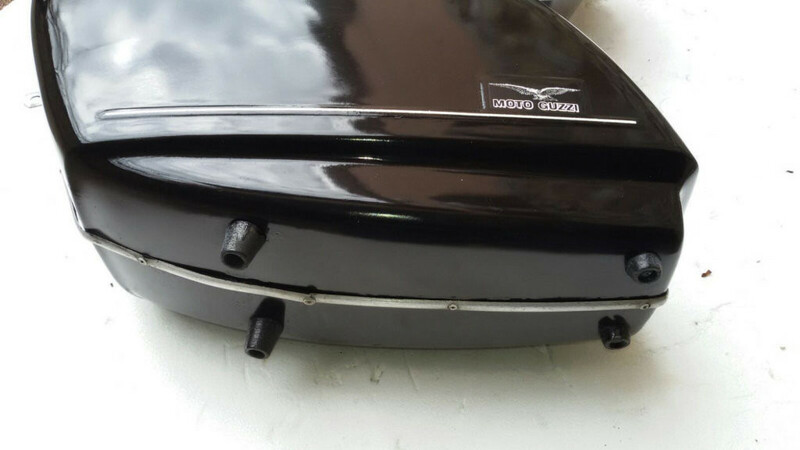 Original Moto Guzzi saddlebags as offered in the spare parts catalogs for the V700, Ambassador, and Eldorado are quite rare (at least in the United States). 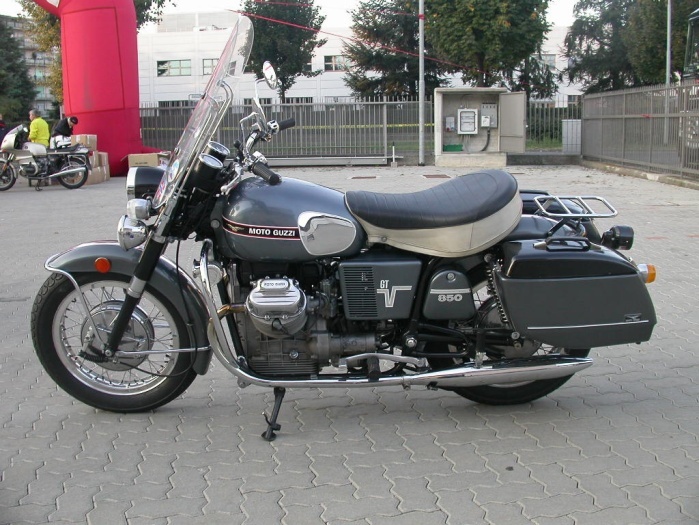 There were four styles offered by Moto Guzzi. 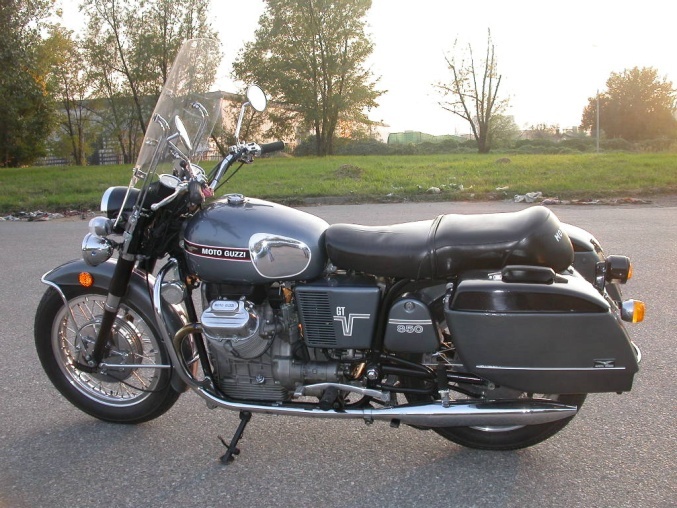 The first reference I can find to Moto Guzzi saddlebags is in the 1968 May , 2nd Edition of the V700 Spare Parts Catalog. 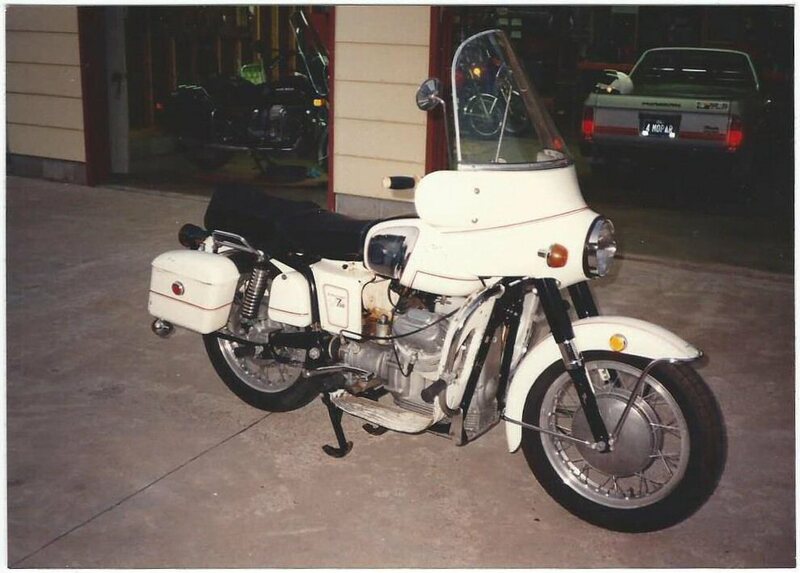 On Plate 24 Police Accessories , the saddlebags (MG# 12483840 and MG# 12482540) and associated rack (MG# 12485040) are shown. 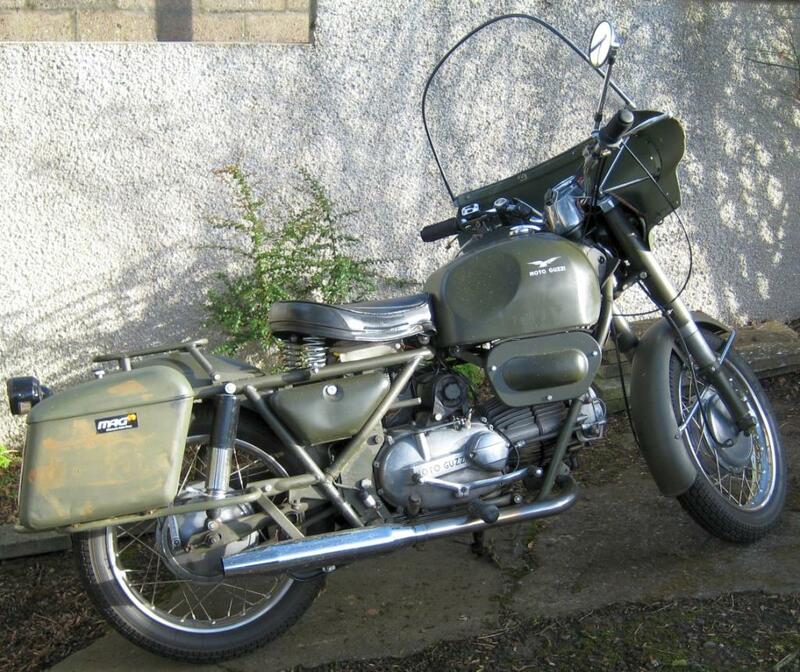 I have seen one set of these in person, on Rob Prins V700. 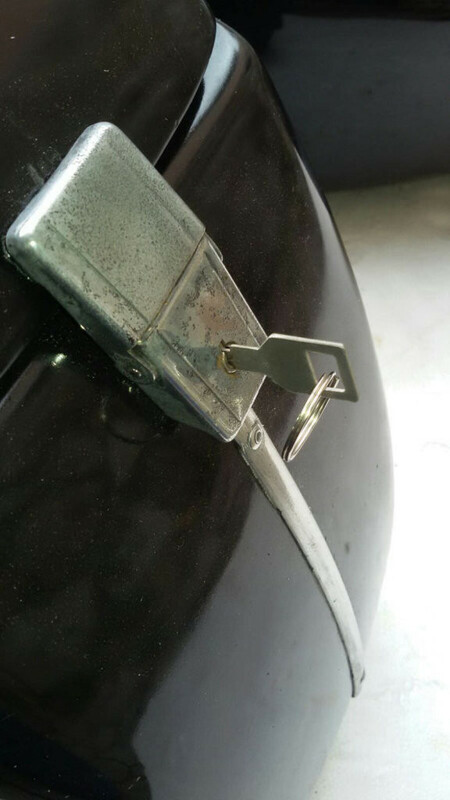 They are small and made out of metal. 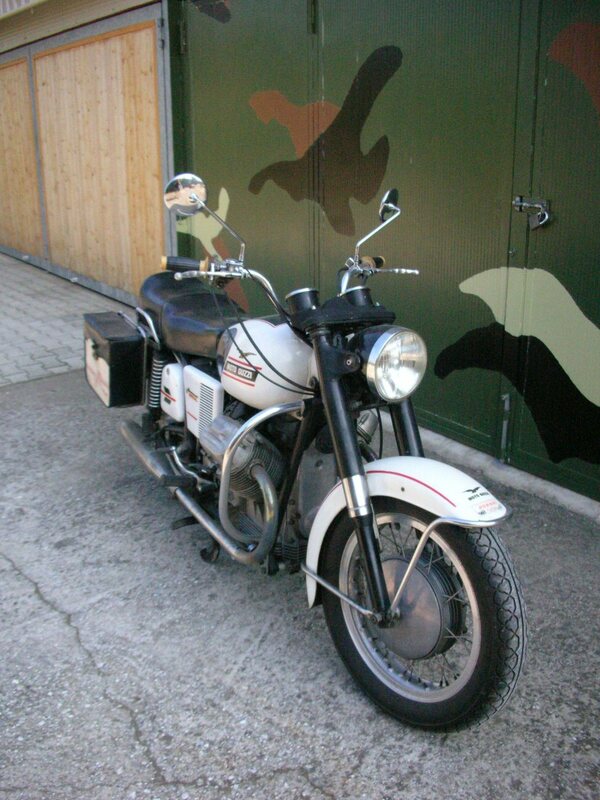 You may (or may not) be interested to know that the early steel ones were also fitted to the Nuovo Falcone Militare, but only, as far as we can make out, to the ones supplied to JNA (Yugoslavian Army). I was lucky enough to pick up a pretty good pair from a friend who's imported one, and is going for a minimal look. 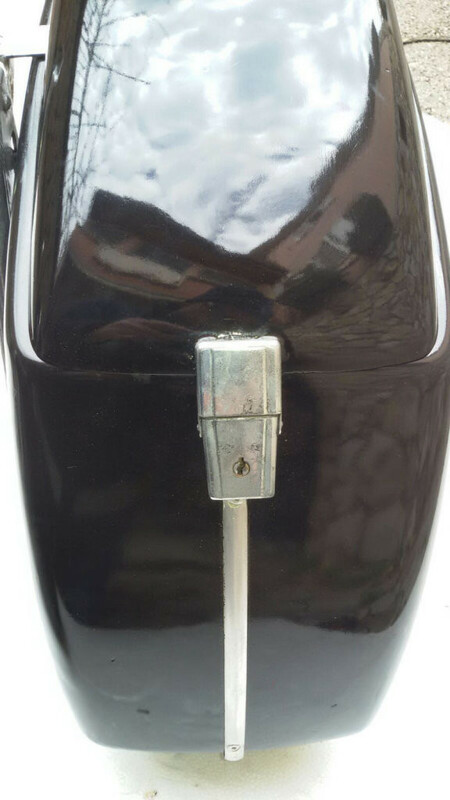 They are small, as you said, but the teardrop shape is very cool, as is the fact they are made from steel, and not fibreglass. 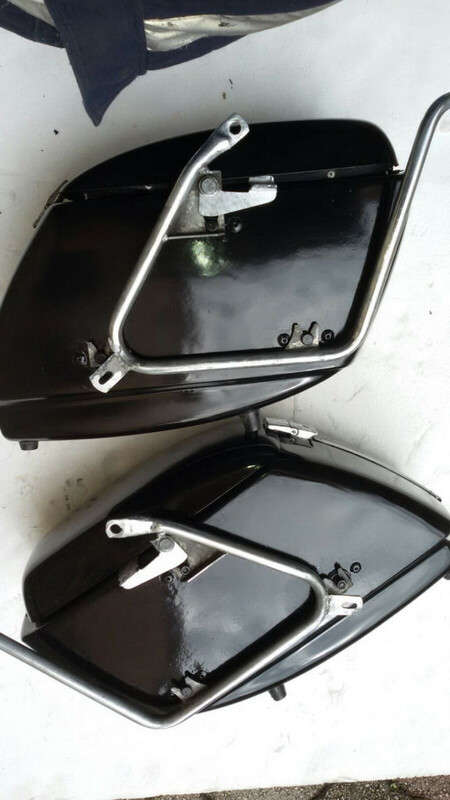 They have the same twist and turn top opening catch as you show on Rob Prins' V700, but the supporting frames are huge and very sturdy. 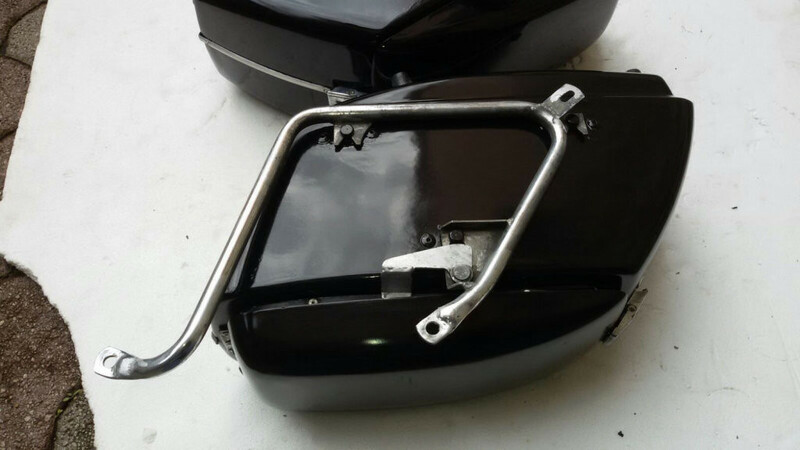 As you can see from the attached pix, the frame loops around the back, and acts as a protector for the rear mudguard or fender. I have better pix if you should be interested. 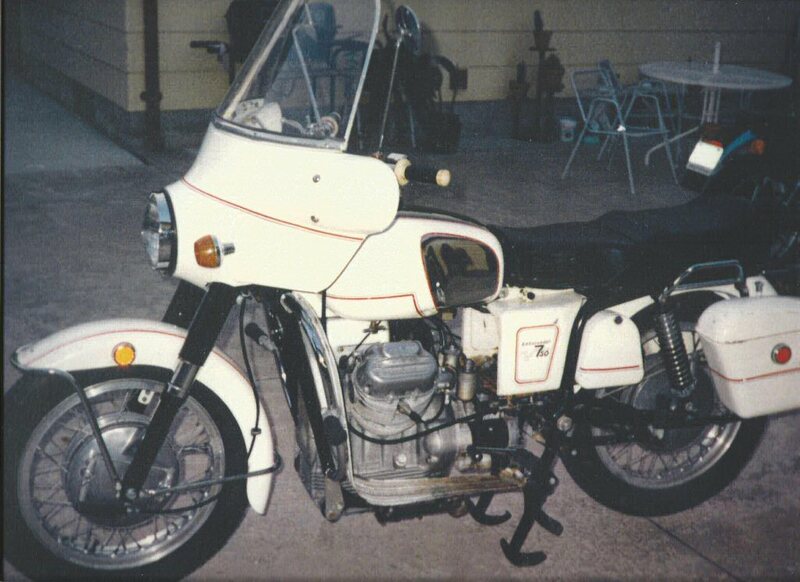 The fairing and windshield seem to be common to loops of the same era too. I got a new screen from Escher in germany, and it was advertised for both models. 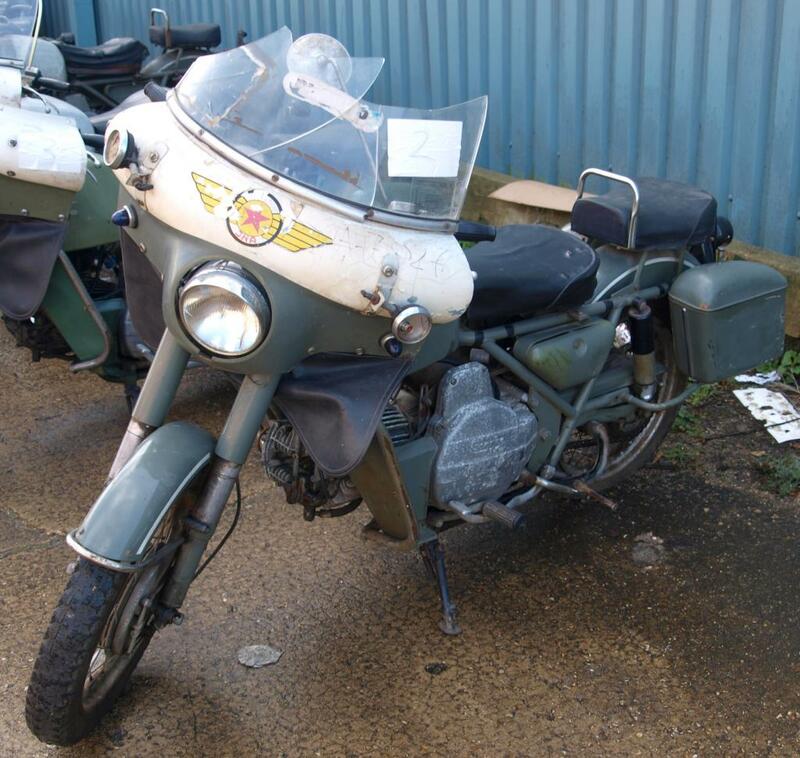 They seem to supply replacement fairings too. 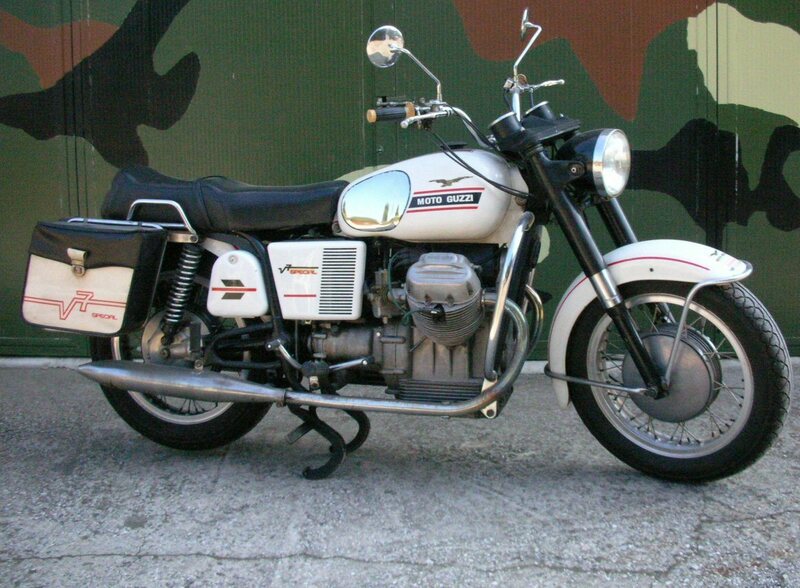 Photo courtesy of Moto Guzzi. 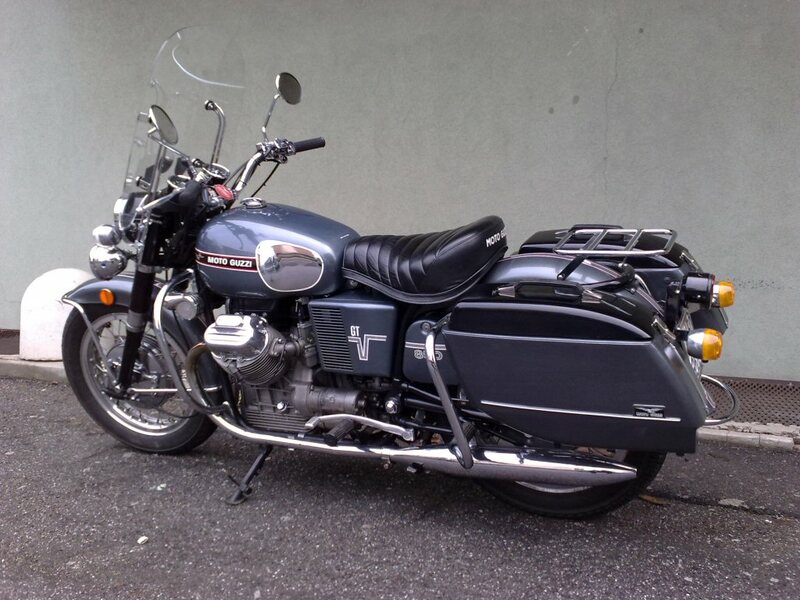 Rob Prins' Moto Guzzi V700 with metal saddlebags. 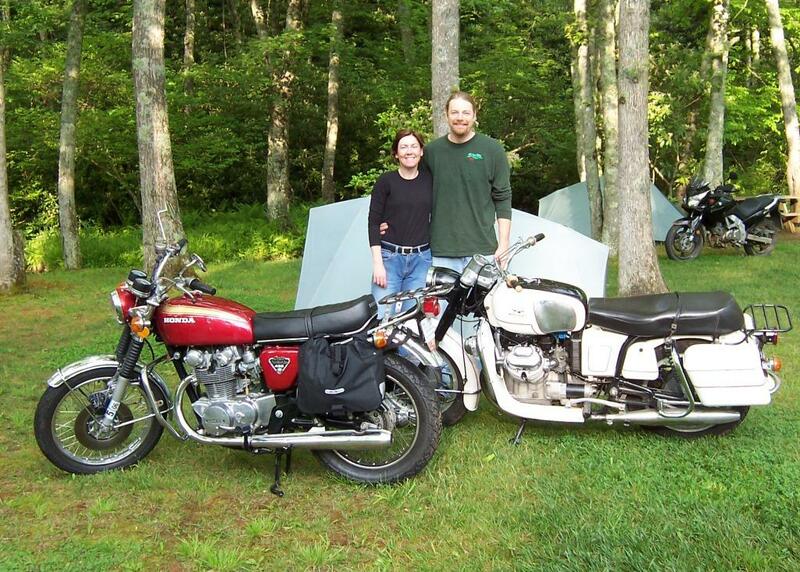 Photo courtesy of Rob Prins. 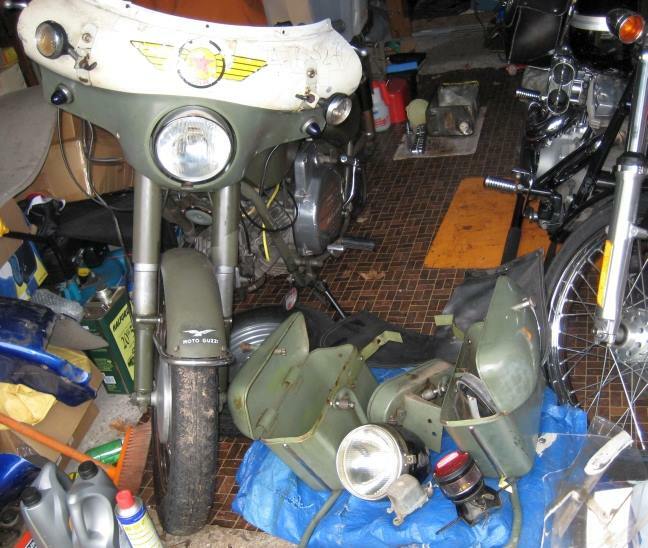 Chris Hayter found these Moto Guzzi metal saddlebags in a storage locker. 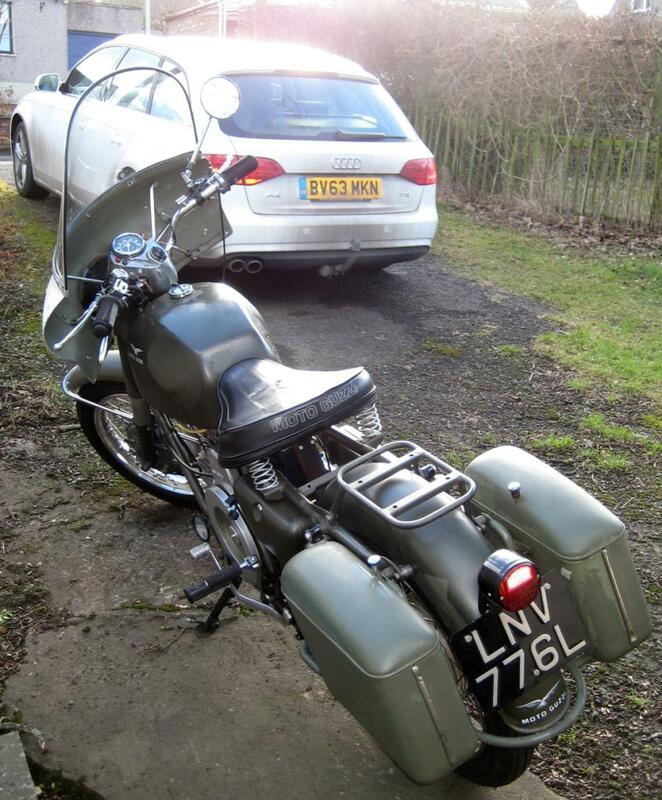 Photo courtesy of Chris Hayter. 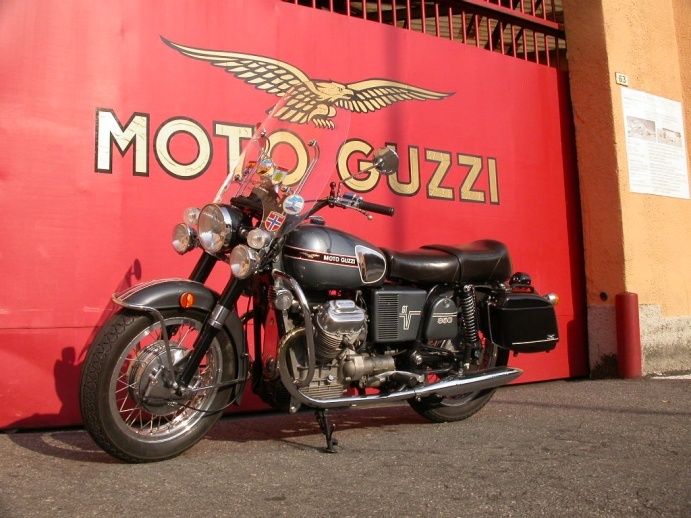 George Vignovich's A-series Moto Guzzi Ambassador with metal saddlebags. 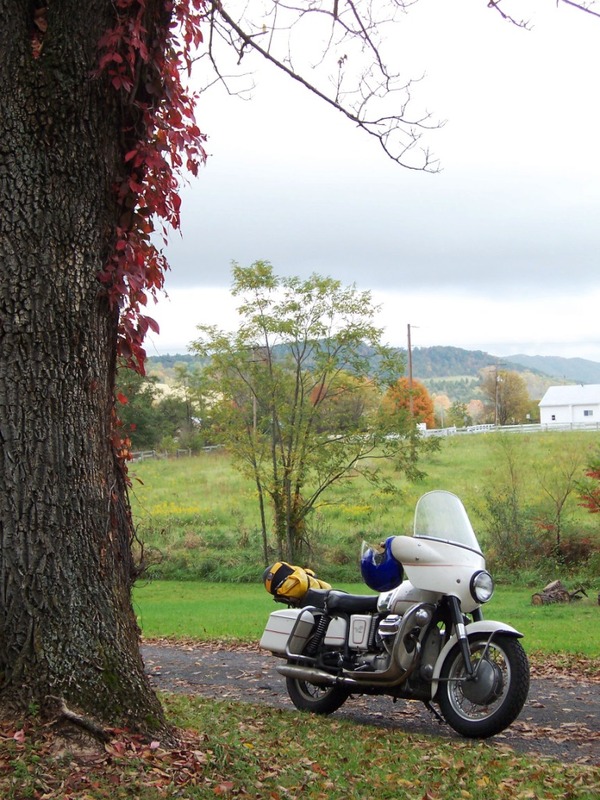 Photo courtesy of George Vignovich. 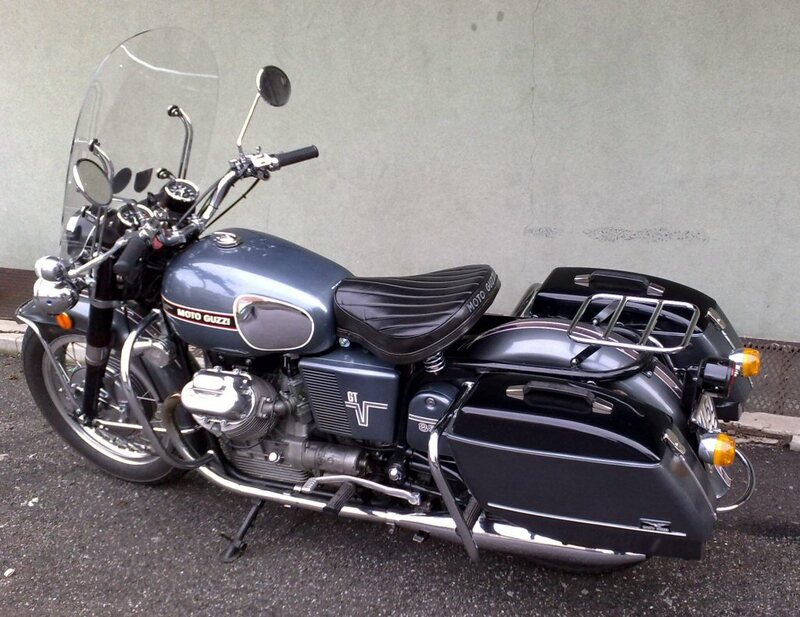 Jake Beatson's Moto Guzzi Nuovo Falcone with metal saddlebags. 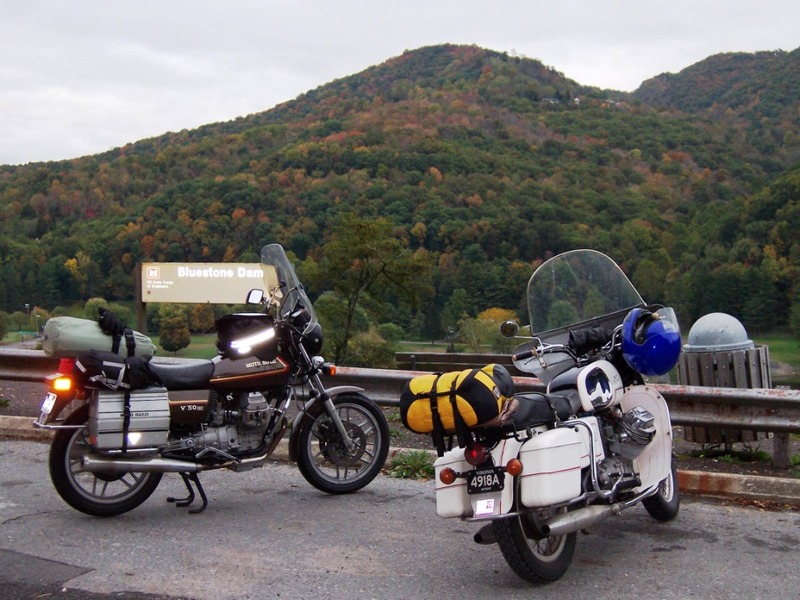 Photo courtesy of Jake Beatson. 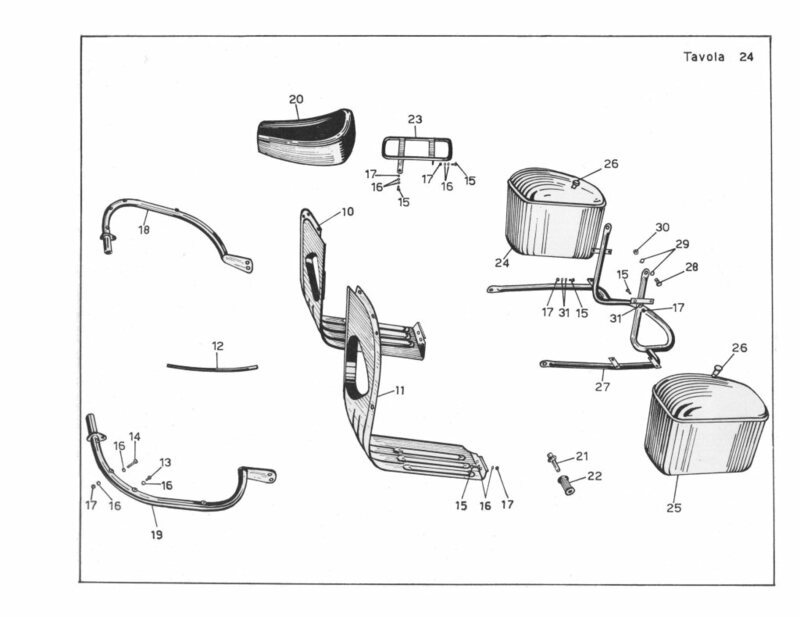 Both the Ambassador Spare Parts Catalog ( 1970 October , 2nd Edition; plate 5/A) and the Eldorado Spare Parts Catalog (November 1972, 1st Edition; plate 19) show a set of saddlebags (MG# 13485700 and MG# 13485700 in the Ambassador Spare Parts Catalog and MG# 13485701 and MG# 13485701 in the Ambassador Spare Parts Catalog). 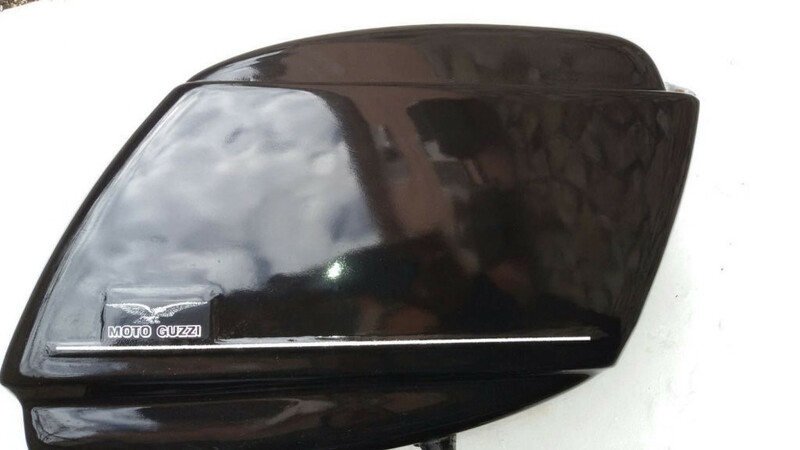 Although the Ambassador and Eldorado Spare Parts Catalogs show different part numbers, the saddlebags appear very similar and it is entirely unclear what the differences actually were. 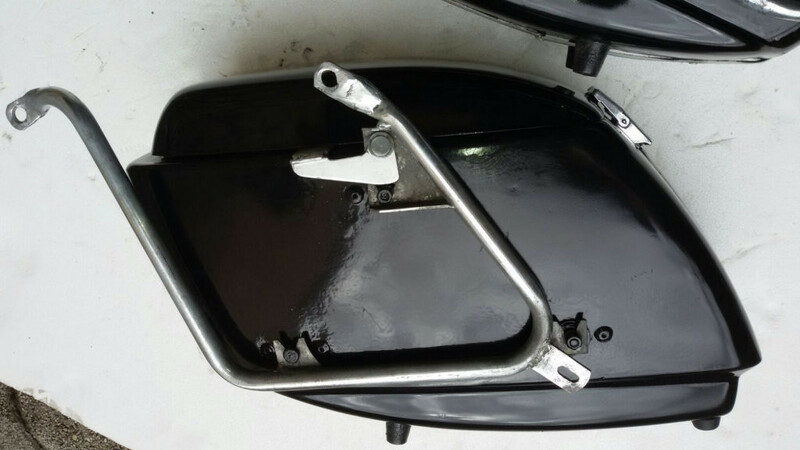 These bags are characterized by a handle on the top and the mounting rack makes them appear to be removable with the flip of a lever (a convenient feature). 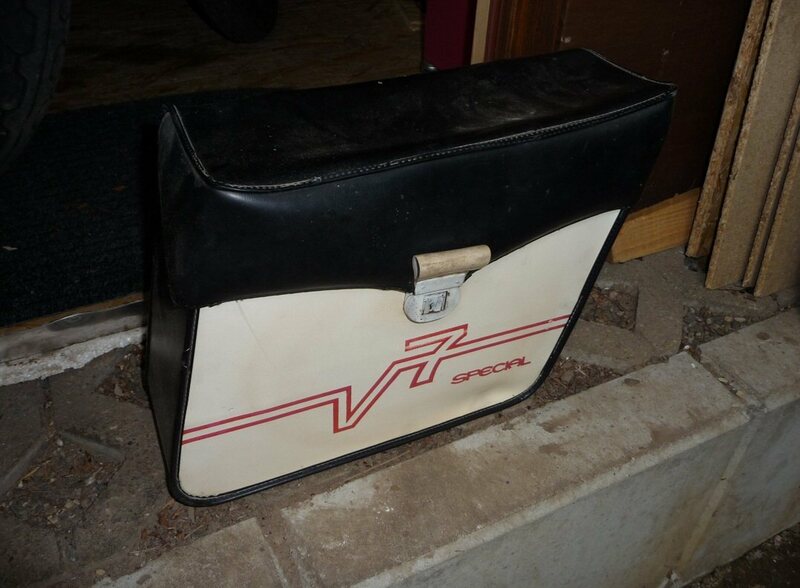 I believe the bags were made of fiberglass. After further information provided by Rossi Paolo (Italy) and Gert Huyser (Netherlands), Mark Barnett (UK), and Ralf Brinkmann (Germany) on the Yahoo! 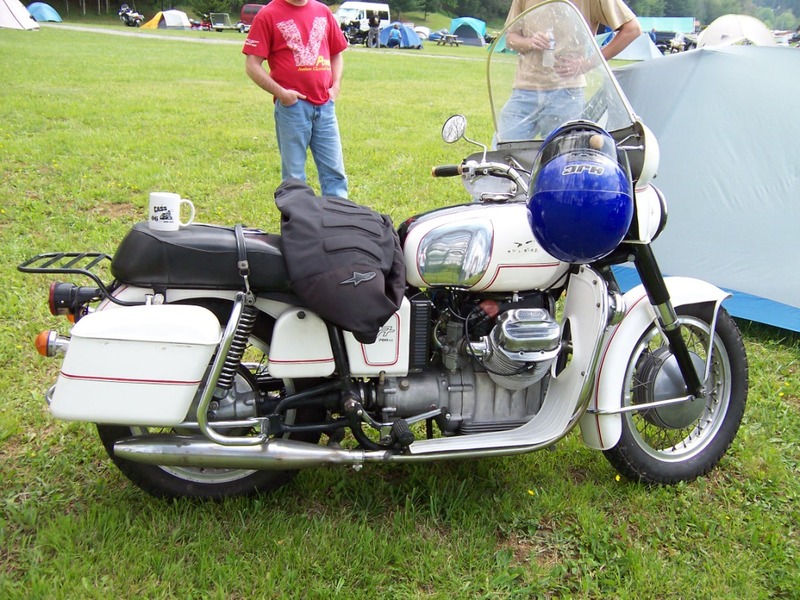 Loopframe_Guzzi news group, I've learned that Moto Guzzi created these original (and smaller) bags. 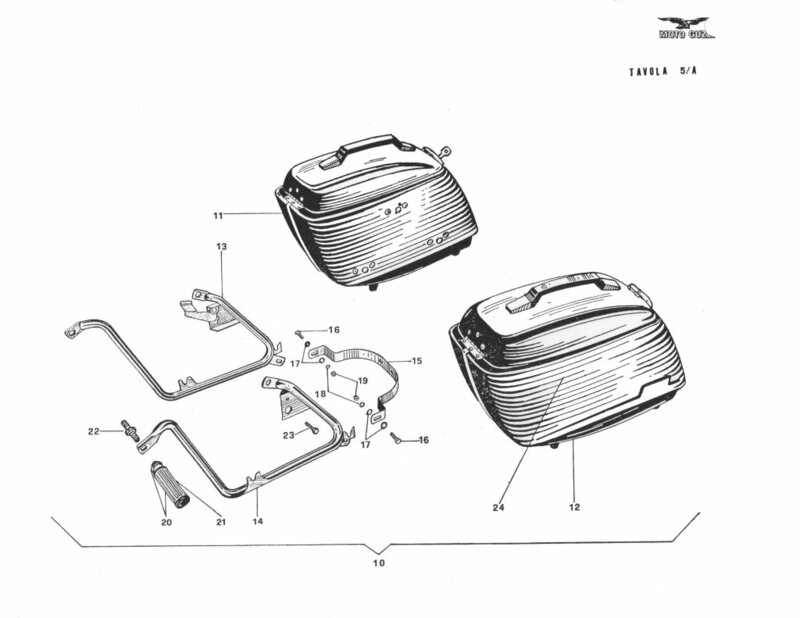 Later, Stucchi produced larger bags for the German market. 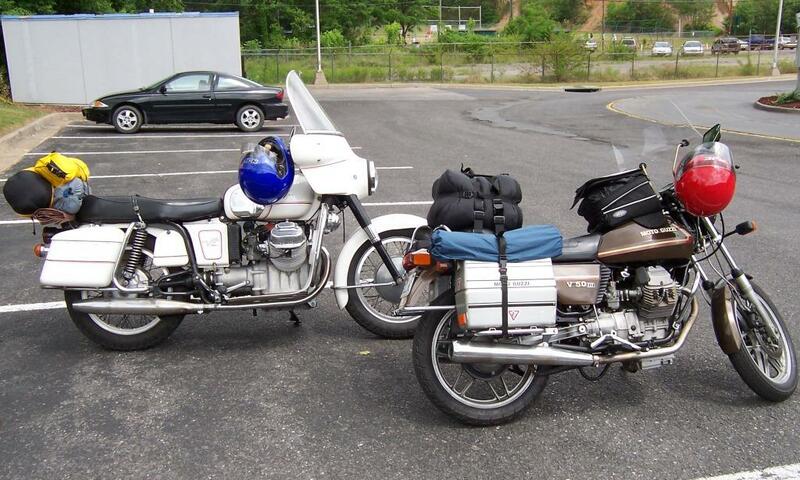 These saddlebags/panniers are much more common in Europe than in the United States. 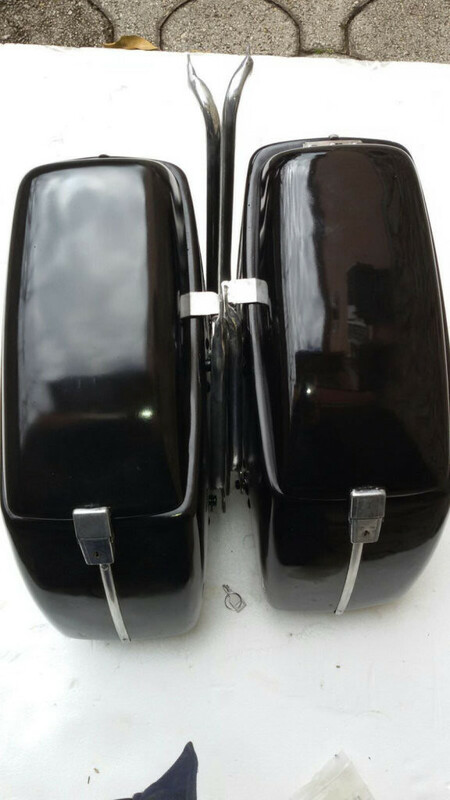 Original Moto Guzzi saddlebags (smaller). 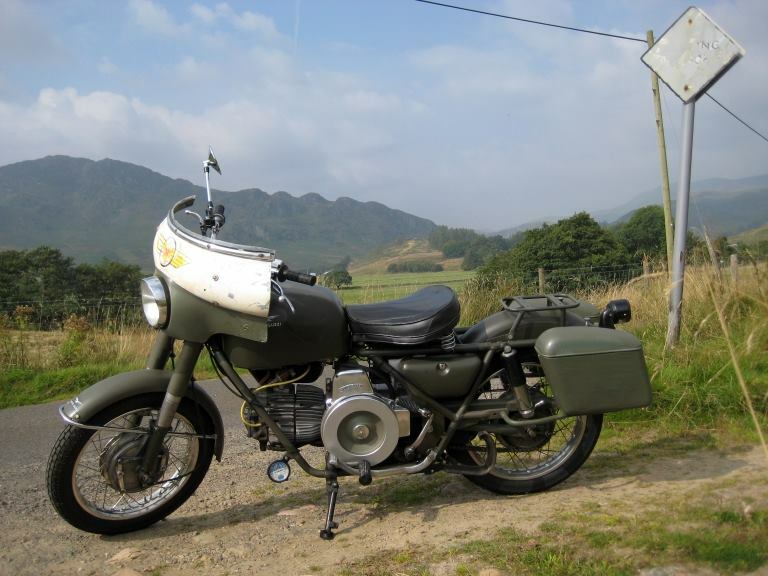 Photo courtesy of Paolo Rossi. 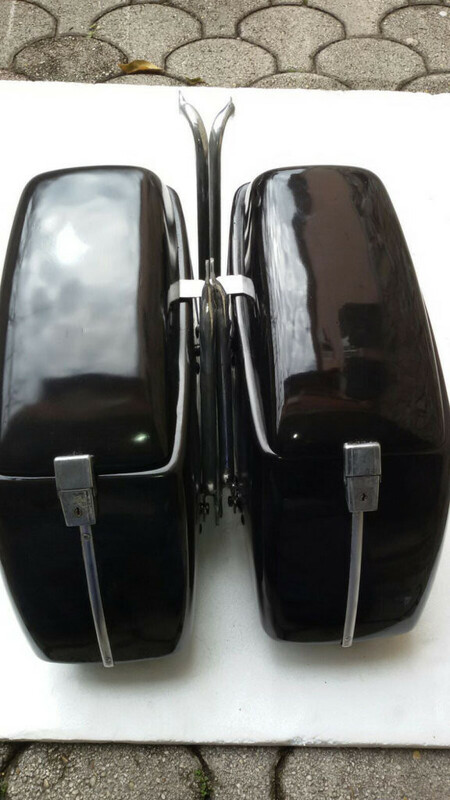 Stucchi saddlebags modeled after the original Moto Guzzi saddlebags (larger). 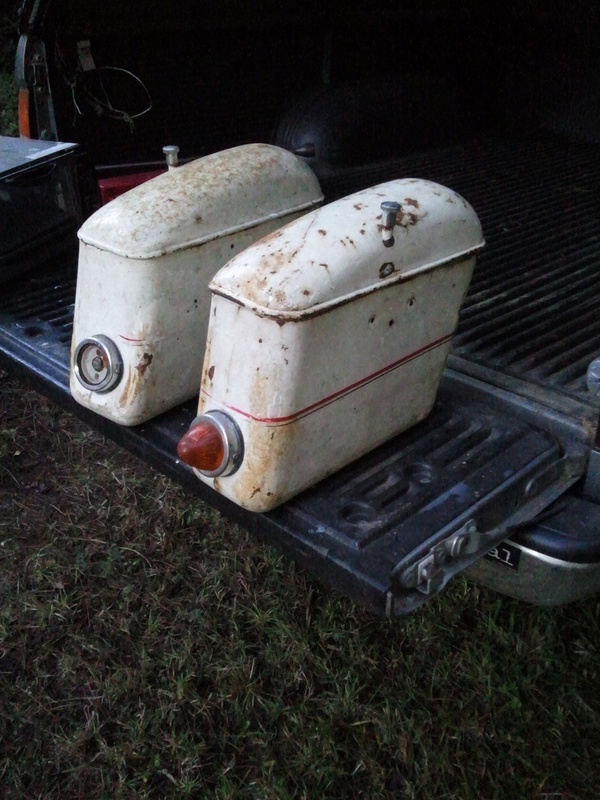 Original Moto Guzzi saddlebags that have had the handles removed from the lid (smaller). 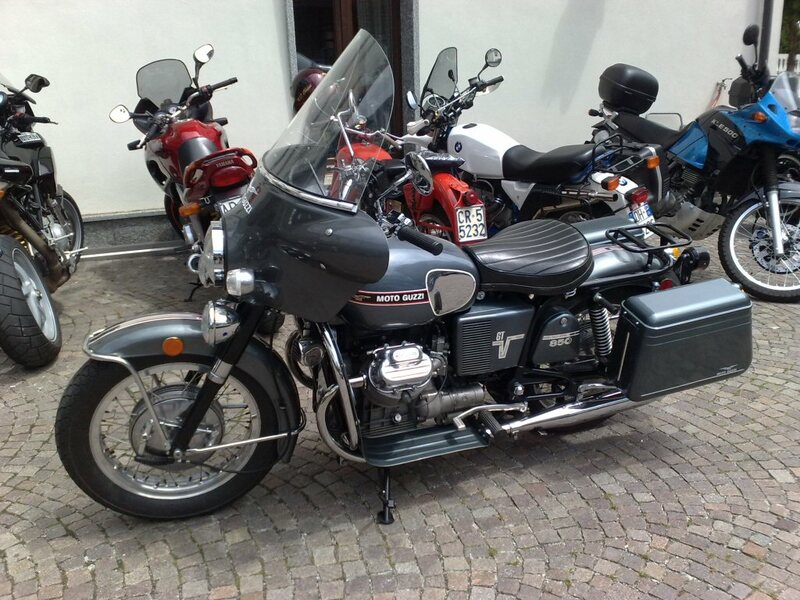 Rossi Paolo (Italy) sent me this photo of the military version of the panniers. 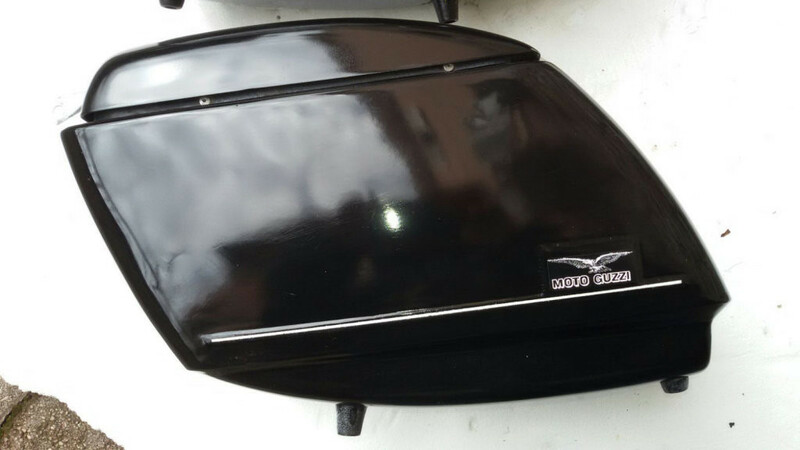 Original Moto Guzzi Military saddlebags. 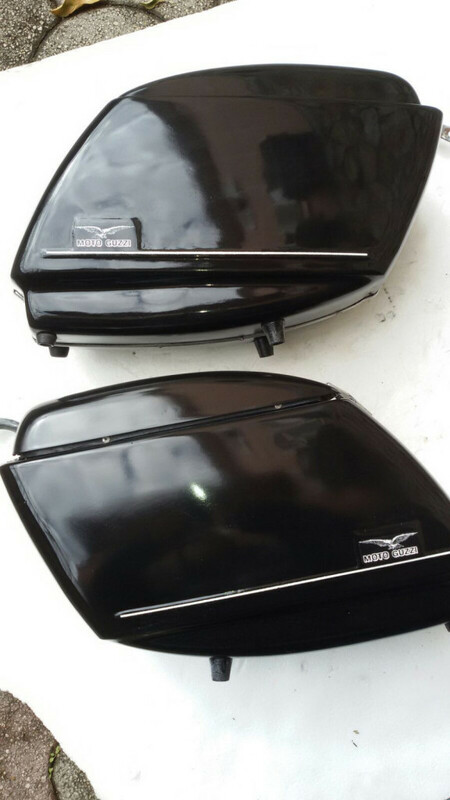 Through a V7 club member I got for you something very special, the saddle bags you are looking at here are the very first Original Moto Guzzi saddlebags which were made for the V7 750 Special and sold on request. 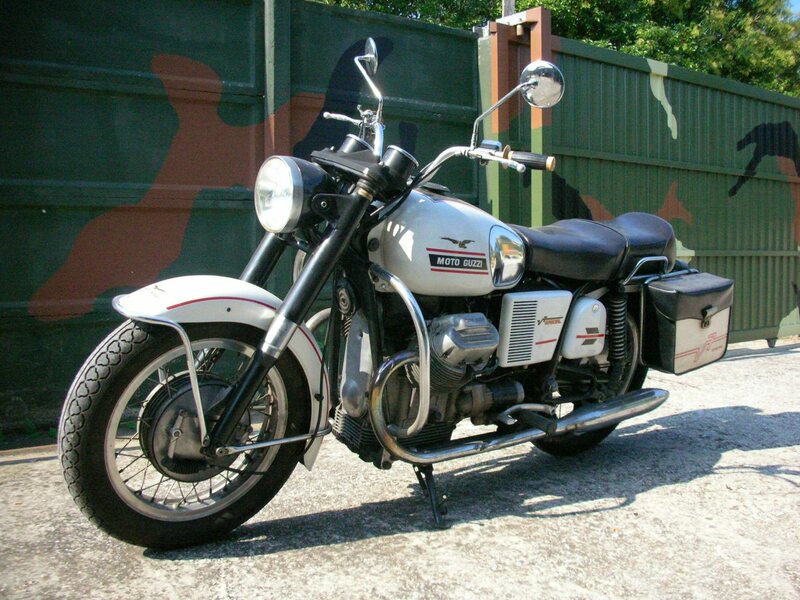 These are very rare to find today because people did not like much soft bags, then not many were produced and sold. 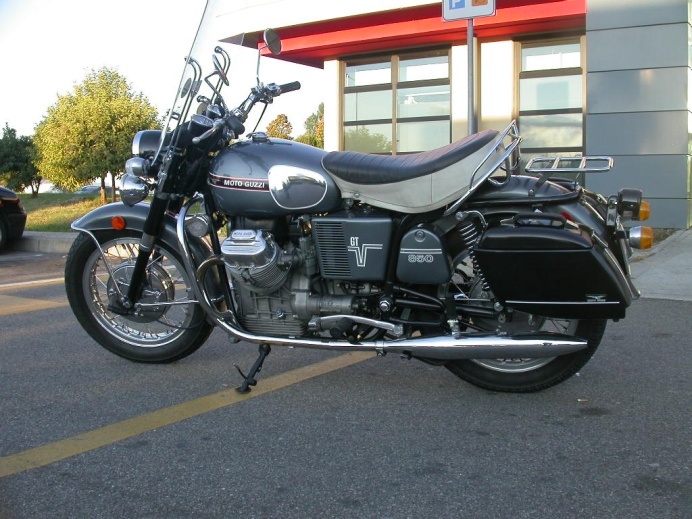 Eventually Moto Guzzi came out later with fiberglass saddlebags with the California style which became very popular and mostly wanted today. The bags are not real leather, they are soft false leather...sort of textile covered with plastic. 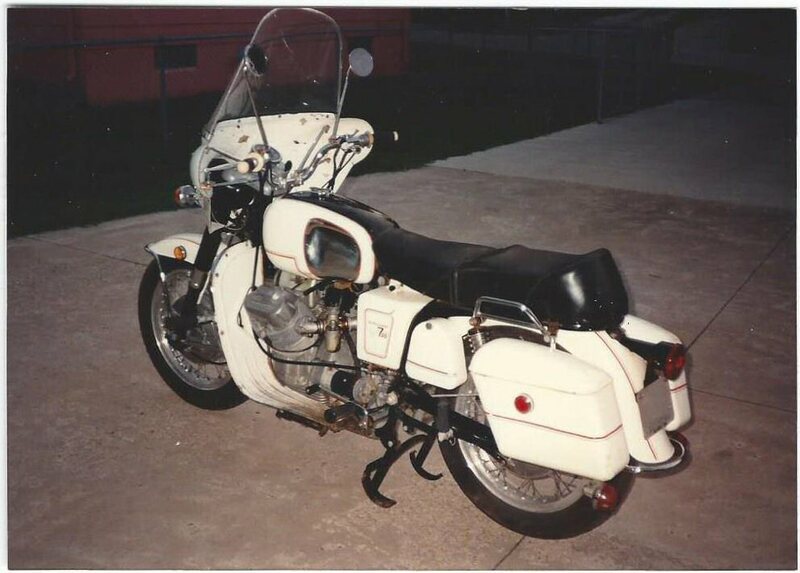 There are no catalogues nor brochure available, unfortunately I don't have any other information, but only memories of my time back in the 70s. 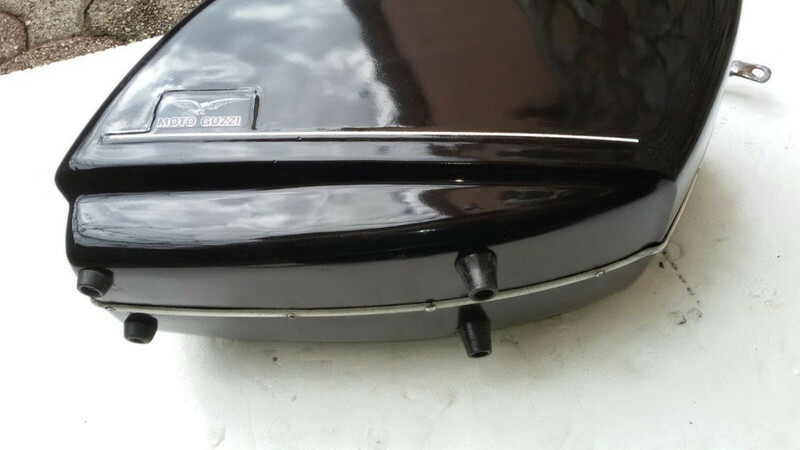 Original Moto Guzzi soft saddlebags.